Planning for a party and don't know where to start from !! 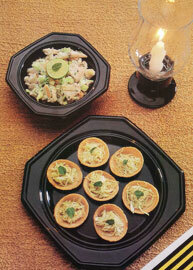 Are you planning to have a party and need help with finalizing the menu for the special event.? Niru Gupta is here to help you and that too at free of Cost !! Once you give us the details of the event like time, venue, type of cuisine, No. of People, type of event etc. we can provide you with a Set of 3 menus to choose from. This service is available only for Registered Members. If you have not yet registered on this site, please fill in a simple Registration Form, and you can then proceed to send in your requirement. Once you have registered you can use the same login information to access the "Recipes" section on this website. The "Recipes" section has an exhaustive list of Recipes for various types of Cuisines and food categories.